The VK1003 Disability Accessible Multi-Occupant Intercom is for use in high rise apartment buildings, condos, senior citizen buildings, assisted care centers, retirement homes, gated communities or anywhere communication with both audio and visual assistance for those with disabilities is needed. The VK1003 is designed to use a standard telephone line as a link between the door or gate entry of an apartment building and the individual tenant's apartment. Since it uses a standard telephone line to communicate with tenants, no special equipment is needed in each home. Tenants simply use their existing telephone, be it a landline or cell phone, which saves you thousands of dollars in equipment cost and wiring. No expensive rewiring is required. The system enables the tenant to speak to the visitor before allowing them to enter the building or complex. To gain access, the visitor must enter a code pertaining to the unit they wish to visit, and then speak to the tenant using the built in hands-free phone. To allow entry, the tenant can then dial a single digit "opener code" on their phone's keypad to operate a door strike. If the apartment access code is known, it may be entered by using the telephone keypad. If the apartment access code is not known, the apartment directory can be used. A visitor may also call a tenant by entering the person's phone number on the keypad. The directory is displayed on a back-lit LCD display with 1/2" tall characters. Alternatively, the tenant names are broadcast over the speaker. When the correct tenant name is displayed/announced, the user simply presses the "Call" button and the VK1003 speed dials the tenant. The visitor may also call a tenant by entering their phone number on the keypad. It has a back-lit LCD display with large 1/2" tall characters is to display a directory of tenants as well as directions and prompts. The built in directory can support up to 525 tenant names and phone numbers and will dial a pre-programmed phone number upon selection of a tenant. When the desired name is displayed and announced, the visitor can press the "Call" button and the phone number for that tenant will be dialed. A built in voice recorder and announcer can also provide a supporting audio message. When a Help button on the front of the unit is pressed, instructions on how to use the system are both displayed and announced. When the Help button is pressed followed by another button, a voice message and display will give the function of that button. A second relay is also provided to operate an automatic door. The VK1003 not only supports keyless entry at the door via its built-in keypad, but also by adding Wiegand-type proximity card readers. 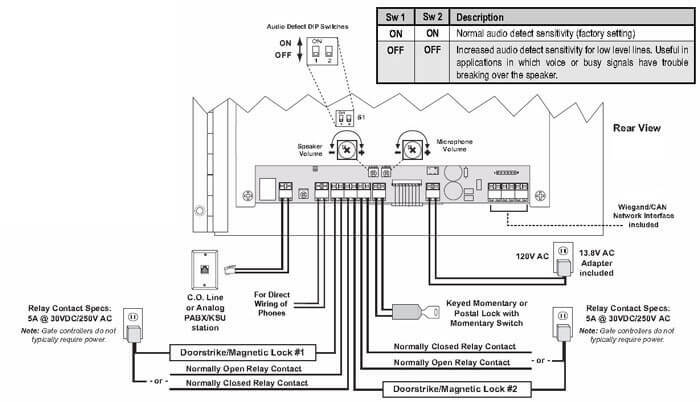 Controls for adjusting speaker volume and microphone sensitivity are included so in noisy locations the speaker volume can be increased and the microphone sensitivity can be decrease as required. A TTY jack is available for TTY (teletypewriter) communication between tenants and the door. Important: If TTY communication is needed, the "silence time out" must be disabled. The unit is available in flush and surface mount configurations and features a highly vandal resistant housing. Note: This unit requires purchasing one VK1004 Remote Programming Kit from Related Products and Accessories to the right. This kit includes a programming device and application software that loads on your PC and enables you to enter tenants names and numbers and program other parameters of the system. A single kit enables its user to manage multiple units with resident's phone numbers and access codes. Using a standard telephone connected to the programming device, the audio recording of each tenant's name can be done so a visitor stepping through the directory of the VK1003 will hear tenant's names. The programming kit also enables the user to retrieve the VK1003's building entry log. Each time the VK1003 energizes the door strike, it adds to the log. It records the date, time name/type (tenant allowing the entry) and code (type of actuation). Up to 1024 entries can be stored before the oldest entry is written over. Relay Contacts: 5A @ 30V DC/250V AC max.